Effectuation is a new proposed theory of entrepreneurship that challenges the traditional understanding of entrepreneurial decision-making and behavior (Sarasvathy, 2001). During the last 15 years, a growing number of studies examine entrepreneurship from an effectuation lens and further develop a variety of ideas related to effectuation. Although effectuation has gained substantial interest in the literature (Arend, Sarooghi, & Burkemper, 2015) theorizing on effectuation is still in its infancy and fragmented. Despite its potential, there is still rather limited diffusion of effectuation into the wider literature. In this Special Issue, we seek to advance effectuation as a theory of entrepreneurship by examining how it relates to other concepts, models, and theories that also seek to understand and explain entrepreneurial action. Such an endeavor may help diffuse the insights from effectuation theory to other literatures, fertilize theorizing in other domains (Arend et al., 2015), and offer new insights back to effectuation. More generally, these efforts may help establish the unique contribution of effectuation to our understanding of entrepreneurial action. To accomplish these objectives, it is useful to construct connections with related and important literature streams related to management, entrepreneurship, and innovation. Starting from existing work on effectuation, several literature streams can be identified. One explores different building blocks of effectuation, such as the different principles or the notion of expertise (Dew, Read, Sarasvathy, & Wiltbank, 2008, 2009; Dew & Sarasvathy, 2007; Dew, Sarasvathy, Read, & Wiltbank, 2009; Sarasvathy, Dew, Read, & Wiltbank, 2008). Another tests the borders of effectuation by using it to examine R&D project behavior (Brettel, Mauer, Engelen, & Küpper, 2012), business angel investing (Wiltbank, Read, Dew, & Sarasvathy, 2009), and product/market strategy decisions (Deligianni, Voudouris, & Lioukas, 2015), with some studies conceptualizing effectuation as a corporate strategic orientation (Werhahn, Mauer, Flatten, & Brettel, 2015). These studies demonstrate that the applicability of the effectuation concept is wide with promising routes also for further research. Existing studies have begun to relate concepts from the entrepreneurship literature to establish conceptual antecedents and consequences of effectuation and causation. Issues such as the role of human capital and organizational environment (da Costa & Brettel, 2011; Johansson & McKelvie, 2012), experience of the entrepreneur (Alsos & Clausen, 2014; Harms & Schiele, 2012), entrepreneurial self-efficacy (Engel, Dimitrova, Khapova, & Elfring, 2014), and career motives (Gabrielsson & Politis, 2011) for the use of effectuation by entrepreneurs have been studied. Further, studies have tested relationships between effectuation and various outcomes such as exit strategies (DeTienne & Chandler, 2010), export/internationalization (Harms & Schiele, 2012; Kalinic, Sarasvathy, & Forza, 2014), R&D project performance (Brettel et al., 2012), new venture performance (Deligianni et al., 2015), creativity in new product development processes (Blauth, Mauer, & Brettel, 2014), and conflict in entrepreneur-investor relationships (Appelhoff, Mauer, Collewaert, & Brettel, 2015). Finally, the potential overlaps and complementarity of effectuation and other emerging concepts as opportunity creation and bricolage (Fisher, 2012; Welter, Mauer, & Wuebker, 2015). Although these studies suggest a variety of interesting mechanisms, critical reviews have called for more solid theoretical grounding for effectuation as well as a better integration with other concepts, models and theories (Arend et al., 2015). – What are antecedents to effectuation, and how does context matter? – How do different types and sources of learning relate to effectuation and causation? – What is the role of goal setting, planning, and negotiations in effectuation and causation? – How is effectuation and causation related to characteristics of entrepreneurial opportunities or business ideas, and to opportunity development processes? – How do effectuation and causation materialize in levels beyond the individual, such as entrepreneurial teams or at the organizational level? – What are relevant dependent variables for effectuation, and how do the causal mechanisms between effectuation and the dependent variables work? – How do effectuation and causation relate to innovation? internationalization, and the choice of product/market strategies? – What role does effectuation and causation play in corporate entrepreneurship? – What are the relationships between entrepreneurial concepts (such as start-up activities, venture gestation, pivoting, business models, venture performance, failure, etc.) with effectuation? – How does theory of effectuation relate to broader theoretical frameworks such as evolutionary theory, resource dependency theory, resource-based view, institutional theory, etc.? 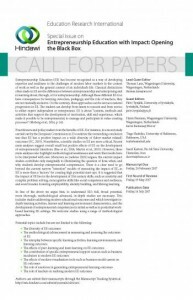 – What is the relationship between effectuation, bricolage, and improvisation? – How can effectual and causal behavior be influenced or shaped by institutional pressures, and how is effectuation linked to the formation and change of institutions? 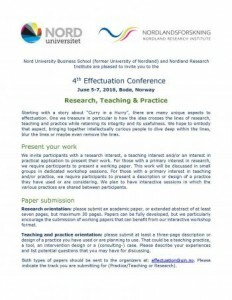 is offered in conjunction with the 4th Effectuation Conference that is to be held in Bodø, Norway June 5-7 2016. • Papers should be 5000-8000 words in length, including references. • All papers should be fully referenced and follow the publisher’s submission policies for style and format. Appropriate permissions should be obtained, where relevant. Journal guidelines are found at: http://www.springer.com/new+%26+forthcoming+titles+%28default%29/journal…. • Submitted papers should not currently be in print or submitted for consideration to another journal. • All papers will undergo double blind review as per standard review process followed by Small Business Economics: An Entrepreneurship Journal. • For additional information, please contact gry.a.alsos@nord.no. Small Business Economics: An Entrepreneurship Journal publishes rigorous research on entrepreneurship, self-employment, family firms, small and medium-sized firms, and new venture creation. The journal has a broad scope, including entrepreneurs’ characteristics, occupational choice, new ventures and innovation, firms’ life courses and performance; as well as the role played by institutions and public policies within local, regional, national, and international contexts. Articles published in Small Business Economics typically emphasize the economic and societal relevance of research findings. As a leading entrepreneurship journal, Small Business Economics publishes both theoretical and empirical papers, while encouraging interdisciplinary and cross-disciplinary research from a broad spectrum of disciplines and related fields. Alsos, G. A., & Clausen, T. H. (2014). The start-up processes of tourism firms – the use of causation and effectuation strategies. In G. A. Alsos, D. Eide, & E. L. Madsen (Eds. ), Handbook of Research on Innovation in Tourism. Cheltenham, UK: Edward Elgar. Appelhoff, D., Mauer, R., Collewaert, V., & Brettel, M. (2015). The conflict potential of the entrepreneur’s decision-making style in the entrepreneur-investor relationship. International Entrepreneurship and Management Journal, 1-23. Arend, R. J., Sarooghi, H., & Burkemper, A. (2015). Effectuation as ineffectual? Applying the 3E theory-assessment framework to a proposed new theory of entrepreneurship. Academy of Management Review, 40(4), 630-651. Blauth, M., Mauer, R., & Brettel, M. (2014). Fostering Creativity in New Product Development through Entrepreneurial Decision Making. Creativity and Innovation Management, 23(4), 495-509. Brettel, M., Mauer, R., Engelen, A., & Küpper, D. (2012). Corporate effectuation: Entrepreneurial action and its impact on R&D project performance. Journal of Business Venturing, 27(2), 167-184.
da Costa, A. F., & Brettel, M. (2011). Employee effectuation – What makes corporate employees act like entrepreneurs. Frontiers of Entrepreneurship Research, 31(17), 2. Davidsson, P., Low, M. B., & Wright, M. (2001). Editor’s introduction: Low and MacMillan ten years on: Achievements and future directions for entrepreneurship research. Entrepreneurship Theory and Practice, 25(4), 5-16. Deligianni, I., Voudouris, I., & Lioukas, S. (2015). Do Effectuation Processes Shape the Relationship Between Product Diversification and Performance in New Ventures? Entrepreneurship Theory and Practice. Dew, N., Read, S., Sarasvathy, S. D., & Wiltbank, R. (2008). Outlines of a behavioral theory of the entrepreneurial firm. Journal of Economic Behavior & Organization, 66(1), 37-59. Dew, N., & Sarasvathy, S. (2007). Innovations, Stakeholders & Entrepreneurship. Journal of Business Ethics, 74(3), 267-283. Dew, N., Sarasvathy, S. D., Read, S., & Wiltbank, R. (2009). Affordable loss: behavioral economic aspects of the plunge decision. Strategic Entrepreneurship Journal, 3(2), 105-126. Fisher, G. (2012). Effectuation, Causation, and Bricolage: A Behavioral Comparison of Emerging Theories in Entrepreneurship Research. Entrepreneurship Theory and Practice, 36(5), 1019-1051. Gabrielsson, J., & Politis, D. (2011). Career motives and entrepreneurial decision-making: examining preferences for causal and effectual logics in the early stage of new ventures. Small Business Economics, 36(3), 281-298. Harms, R., & Schiele, H. (2012). Antecedents and consequences of effectuation and causation in the international new venture creation process. Journal of International Entrepreneurship, 10(2), 1-22. Johansson, A., & McKelvie, A. (2012, 6-9 June 2012). Unpacking the antecedents of effectuation and causation in a corporate context. Paper presented at the Babson College Entrepreneurship Research Conference, Fort Worth, TX, USA. Kalinic, I., Sarasvathy, S. D., & Forza, C. (2014). ‘Expect the unexpected’: Implications of effectual logic on the internationalization process. International Business Review, 23(3), 635-647. Perry, J. T., Chandler, G. N., & Markova, G. (2012). 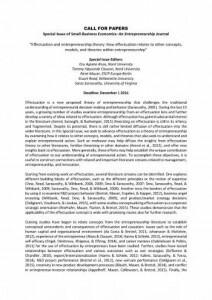 Entrepreneurial Effectuation: A Review and Suggestions for Future Research. Entrepreneurship Theory and Practice, 36(4), 837-861. Sarasvathy, S. D., Dew, N., Read, S., & Wiltbank, R. (2008). Designing Organizations that Design Environments: Lessons from Entrepreneurial Expertise. Organization Studies, 29(3), 331-350. Welter, C., Mauer, R., & Wuebker, R. (2015). Bridging Behavioral Models and Theoretical Concepts: Effectuation and Bricolage in the Opportunity Creation Framework. Forthcoming, Strategic Entrepreneurship Journal Special Issue: Theories of Entrepreneurship. Werhahn, D., Mauer, R., Flatten, T. C., & Brettel, M. (2015). Validating effectual orientation as strategic direction in the corporate context. European Management Journal, 33(5), 305-313. Wiltbank, R., Read, S., Dew, N., & Sarasvathy, S. D. (2009). Prediction and control under uncertainty: Outcomes in angel investing. Journal of Business Venturing, 24(2), 116-133. – How is effectuation and causation by the entrepreneur related to subsequent organizational processes such as resource acquisition, financing, resource configuration, internationalization, and the choice of product/market strategies? • All papers should be fully referenced and follow the publisher’s submission policies for style and format. Appropriate permissions should be obtained, where relevant. Journal guidelines are found at: http://www.springer.com/new+%26+forthcoming+titles+%28default%29/journal…. Engel, Y., Dimitrova, N. G., Khapova, S. N., & Elfring, T. (2014). Uncertain but able: Entrepreneurial self-efficacy and novices׳ use of expert decision-logic under uncertainty. Journal of Business Venturing Insights, 1, 12-17. Onramp Enterprises, a 501(c)3 non-profit educational organization, currently located and operating in Portland, Oregon, is seeking to add new locations beginning in the summer of 2017, and is actively seeking candidates who can help fulfill our mission and build our program. In keeping with the tenets of effectuation, Onramp’s Board of Trustees has chosen to determine location of our first expansion cities in large measure dependent on the City Director candidates who step forward with an interest in collaborative development. Both US and international locations are open for consideration. Onramp City Directors will be paid a stipend of $20,000($US) — and are anticipated to be supported by a TA who will also receive compensation. Starting with a story about “Curry in a Hurry”, there are many unique aspects to effectuation. One we treasure in particular is how the idea crosses the lines of research, teaching and practice while retaining its integrity and its usefulness. We hope to embody that aspect, bringing together intellectually curious people to dive deep within the lines, blur the lines or maybe even remove the lines. Research orientation: please submit an academic paper, or extended abstract of at least 7 pages, but with a maximum of 30 pages. Papers can be fully developed, but we particularly encourage the submission of working papers that can benefit from our interactive workshop format. Both types of papers should be sent to the organizers at: effectuation@uin.no. Please indicate the track you are submitting for (Practice/Teaching or Research). We look forward to see you in Bodø! Summer effectuation boot camp for startups – June 8-12 – please see link for full details. See the link for event description.